SWBAT predict why some African Americans were willing to fight in the war and some were not. When the war started, there were many free blacks in the North. These men volunteered to fight for the Union army. At first, President Abraham Lincoln did not want to recruit black soldiers. He did not want to upset people in the Border States between the South and the North. He also did not want to anger people in the North who did not want to fight a war over slavery. He insisted the North was fighting the war to save the Union. Blacks were disappointed, but they didn’t stop trying. Through 1861 and most of 1862, they pushed to be allowed in the army. Even if Lincoln did not want to say it, most blacks knew this was a war against slavery. It was harder to decide what to do with escaped slaves. As the Union army would go near a plantation, many slaves would escape and cross over to the Union side. Some thought the slaves should be sent back. Others put them to work helping the Union army. Finally, escaped slaves were declared “contraband of war.” A slave could earn this title if he had been forced to help the Confederates in any way. If a slave was found to be contraband, he was declared to be free. The North continued to not allow black soldiers to fight with the army. But in the South, slaves were being forced to help in many different ways. They had to build forts and work as nurses. By 1862, Lincoln was starting to think about freeing the slaves. The war would then not just be fought to preserve the Union; it would be fought to end slavery. This would give the Union army a “moral high ground” and gain backing from unlikely supporters. Lincoln waited until the North had won a major victory to issue the Emancipation Proclamation. In September of 1862, the Union won at Antietam. On September 22, Lincoln read his speech. If Confederate states had not given up by January 1, 1863, their slaves would be freed. Many people feared Lincoln would go back on his promise. He did not. All slaves in Confederate states were declared free on that date. Black men in the North rushed to enlist. This time they were not turned away. All-black units were started. These units usually had white men in charge of them. The first was the 54th Massachusetts Regiment. Robert Gould Shaw commanded it. Frederick Douglass had two sons who served in it. This group of men proved to the country that black men could fight as well as white men. 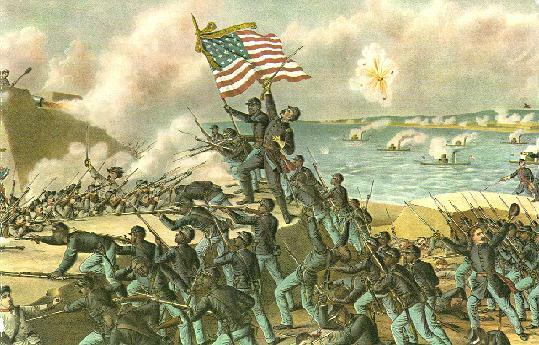 In July of 1863, the regiment attacked a fort in South Carolina. Under heavy fire, they made it to the fort before they were forced to retreat. Almost half of the regiment died, including their commander. Their courage helped to win respect for black soldiers. In the South, many slaves did not hear about the Emancipation Proclamation right away. They kept running away as the Union army came close. Many Southern planters did not think that their slaves would run away. They were wrong. Thousands were running away every week. Fighting in the army was not easy for blacks. They were often treated unfairly. They were also paid less than white soldiers. 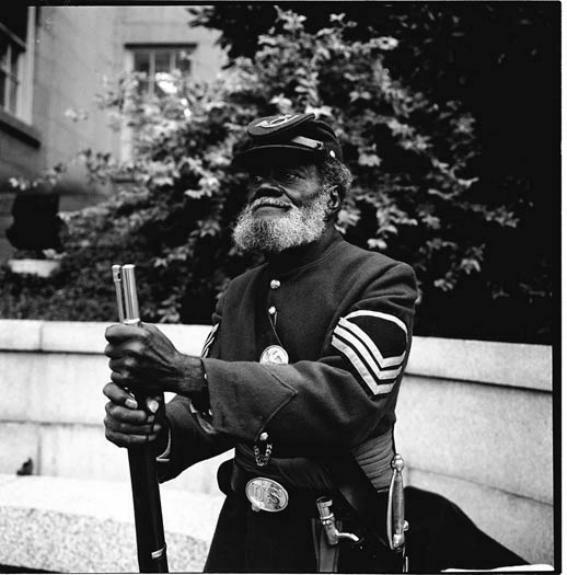 Many people in government thought the black soldiers would not actually be fighting, so they weren’t paid as much money. In 1864, the War Department said that all soldiers would be paid the same. It was very hard for a black soldier to become an officer. Only about one hundred men were made officers during the war. White soldiers led most black regiments. African American soldiers did prove themselves during the war. Sixteen of them were awarded the Medal of Honor. The first African American to win the honor was Sergeant William Carney. African Americans proved themselves during the war. They fought bravely to end slavery for themselves and their families. After the war, many of them would go back south to try to find the families they had been separated from. 1. Who led the 54th Massachusetts Regiment? 2. After what battle did Lincoln issue the Emancipation Proclamation? Why did he wait? 3. As the Union army came close to plantations, what did many slaves do? 4. How many African Americans were awarded the Medal of Honor? 5. What was the first black regiment? 6. Who was the first African American to win the Medal of Honor? Would you have fought with the Union army if you had been African American? Why or why not?